Argentine legend Diego Maradona who was admitted to a hospital recently for an emergency operation took a dig at Lionel Messi once again and attacked his fellow countrymen over his lack of leadership skills. "I love Messi with all my heart. They want to make him a leader but he isn't able to do that because he's going to be in his sporting world and with his family," Maradona told Argentine newspaper 'Olé' as quoted by Mirror. Being one of football's all-time greats, Diego Maradona's current dig echoes his controversial criticisms regarding Lionel Messi after Argentina's poor run in the World Cup last year. The World Cup winner statements reflect his already infamous opinions regarding Lionel Messi. Back in October 2018, he took similar digs about Messi's personality and mostly, about his leadership skills. "We shouldn't deify Messi any longer," he told Fox Sports. "He's Messi when he plays for Barcelona. Messi is Messi when he wears that shirt, and he's another Messi with Argentina." Maradona told fox sports as quoted by ESPN. "He's a great player but he's not a leader. It's useless trying to make a leader out of a man who goes to the toilet 20 times before a game," he added. Lionel Messi is hailed by his fans and most pundits in the world as the greatest player of all-time. The Barcelona forward has scored over 660 goals for his club and country over the span of last 12 years and has won many trophies with his teams and several individual honors. While the staggering statistics in front of goal depicts the greatness of Lionel Messi, the five-time Ballon d Ore winner is criticized for his mentality and his ability to lead due to his failures in crucial moments with Argentina. In recent interviews, Diego Maradona has openly pointed out why Lionel Messi will never be a great leader despite his heroics on the field. Even the great Pele recently criticized Messi by calling him a 'one skill player'. 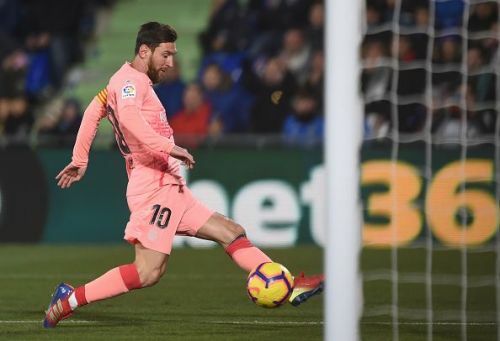 While these criticisms are sometimes harsh on Lionel Messi, he himself has been reluctant to open his mouth and reply to the digs pointed at him. Being the talisman for both Barcelona and Argentina for more than a decade, Messi maintains his humbleness and chooses to make his performances do the talking for him.